Two years ago, a friend forwarded me a job opening for a pilot to teach an aviation class at a local high school. It was the first time I heard about such a program, and I knew right away that I wanted to do it. It worked with my part-time pilot and full-time mom schedules. And, of course, I was ecstatic to share my love of flying with students and steer them towards aviation. I experienced my first day as a teacher facing 40 teenagers. I expected them to jump around and cheer as I announced we would be studying aviation. Instead, I was met with suspicious looks and not a smile in the room. And the room is huge. My classroom used to be the high school's weight room. It is very spacious and was at the time empty. To engage my students, and to keep them engaged in a large classroom, I knew that our class needed to be interactive. Here's how I achieved that. To capture the attention of the students, I implemented multimedia into my lectures. I began showing fun videos and using them to introduce and teach the history of aviation. The kids responded. They grabbed ahold of the lessons and began to ask questions. I started a speaker series. With the students' interests piqued, I called some of my friends to come speak about their careers. The kids enjoy having speakers in the class and consistently interact with them. The sessions have opened their horizons and put a face to what's possible. They permit students to meet people they might not talk to otherwise, and ask them all kinds of questions. I made it a tradition to have speakers in the class at least once a month. We've had speakers from NASA, the Air Force, the major airlines, Air Traffic Control, and Skunk Works. We even had the one and only Sean D. Tucker spend a morning with us, and autograph our Redbird FMX! I integrated simulation into my curriculum. The day we received our simulators was a big deal. Finally, the kids would see that I was not lying when I told them they would learn how to fly in my class! We received 10 Redbird TD simulators with the rudder and Horizon options, as well as a full-motion FMX. I was so lucky. My room was now full, and the students began to enjoy the TDs and were even more excited to fly the full-motion FMX. Since then, I divide my week between ground and simulator instruction. I use the Jeppesen Private Pilot Handbook in ground school. I go through about three-quarters of the book in Aviation 1 and finish the rest in the first semester of Aviation 2. We then spend the second semester of Aviation 2 preparing for the private pilot written test. I use Gleim on Chromebooks to practice the test. STEM is integral to a lot of the subjects we cover: airplanes, power plants, systems, flight instruments, aerodynamic principles, navigation, weight and balance, performance calculations, weather, airports, and air traffic control. Almost everything in aviation relates to a STEM subject. 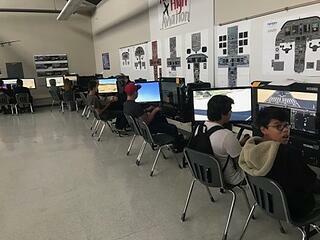 The simulators are a huge part of the class. They really help the kids learn and experience many concepts of flying. Having a solid foundation of flight basics also reduces the cost of their flight training. We still have many speakers and go on field trips. Our principal and local aviation community both are very supportive of my program. Through the EAA Young Eagles Program, we now are able to take the kids flying at least once per year. As I see all smiles coming out of the planes, it easily is my favorite day of the year. Our location is one of the biggest obstacles for the students. In an underserved neighborhood, it can be difficult to access flight training. Currently, we apply for scholarships like the AOPA High School Initiative. We're in the midst of trying to build our own scholarships as well. Two of my students from last year are now at California Aeronautical University earning their wings and their degree in aviation. 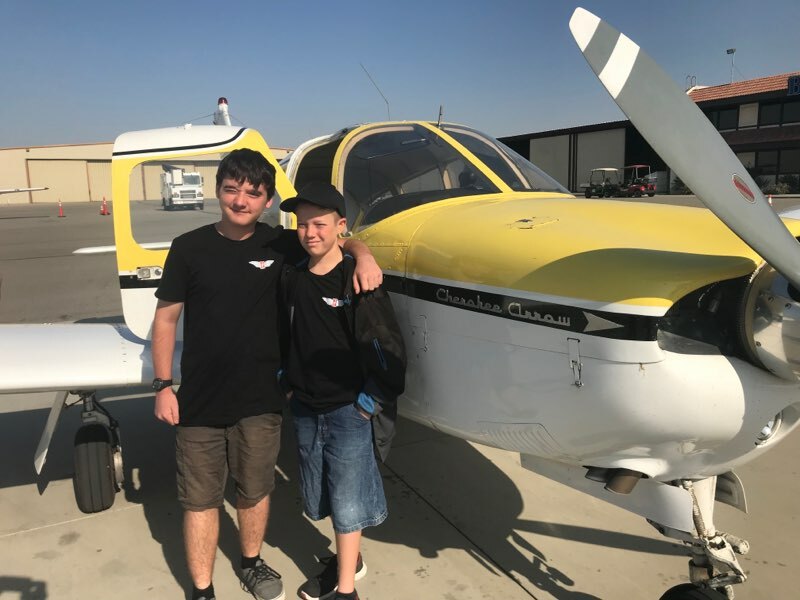 Two of my current students are in flight training at the Bakersfield Flying Club. Others still are trying to find a way. 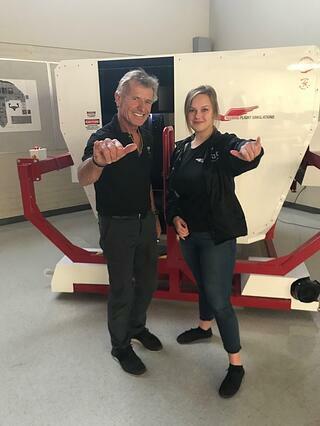 It is so fun to see them plunge into the real world of aviation and I cannot wait to see what the future holds for them. This program not only helps the kids discover aviation but also exposes them to the different careers aviation has to offer. It shows them how to get qualified and allows them to meet many amazing people from the field, ask them questions, and visit airports and other cool and inspiring places. They get a general knowledge of flying and learn about a field that once seemed unattainable. They can chase their dream and make it a reality. 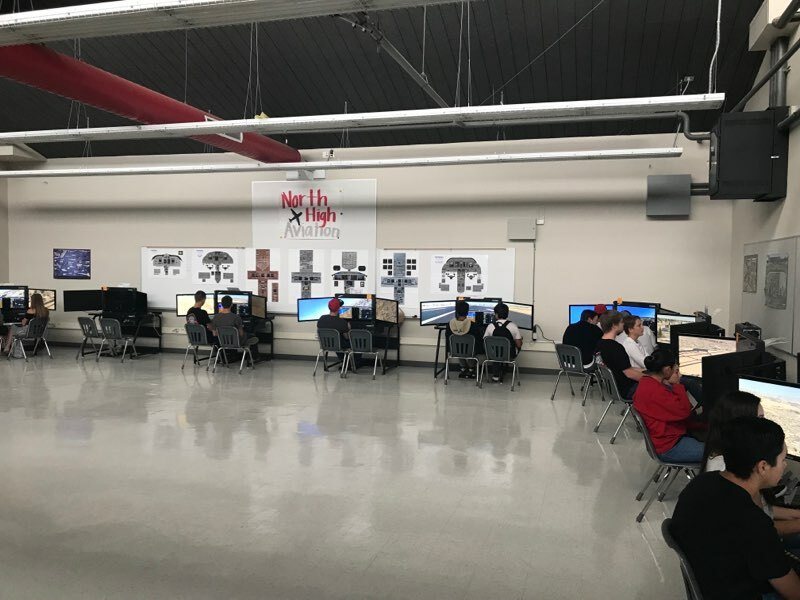 For more on the North High Aviation Program, and all of Kern High School District's STEM programming, visit its page here. You're a Great Pilot. Your Decision-Making Is Terrible.